As a parent, you want to help your child develop coping skills so they can face adult life as skillfully as possible down the road. Part of that is helping them feel comfortable in the dental chair so they can get the care they need for a healthy smile. And, as with any “first” for kids, a little preparation goes a long way towards helping it go smoothly. Keep reading for 5 easy things you can do to prepare your child for their first visit to a children’s dentist in Brampton and help them avoid developing the fears that plague so many adults! The American Dental Association recommends that children see a family dentist for the first time when the first tooth comes in (or around their first birthday). Don’t worry too much if your child is older than that – just schedule them as soon as possible. At this age, children won’t get a cleaning or X-rays, but they will have their teeth visually examined. Although these visits are very fast and simple, they’ll make seeing the dentist a lot easier as kids get older. Children’s books are a great tool for explaining the importance of seeing a dentist and addressing any fears kids may have. They also use positive, non-threatening language to describe checkups in ways your child can easily understand. 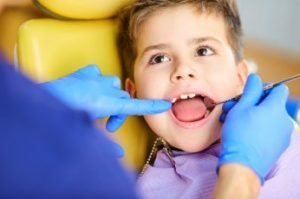 Children don’t start out with existing ideas that they should be scared about seeing the dentist, so these phrases can make them wonder why they need reassurance in the first place. Establishing good oral hygiene habits from an early age will make the first checkup easier. It not only helps young children get accustomed to having their teeth and gums cleaned, it also helps them feel more comfortable in the dental chair. Also, since their teeth and gums will be healthier, they’re less likely to have cavities that require extensive dental work. The goal is to keep dental work to a minimum and only do routine checkups so that kids don’t associate the dentist with uncomfortable procedures! Seeing the dentist for the first time can feel a bit scary for any child, but with these 5 tips, you can make it much easier. And, most importantly, you’ll get them off to a great start for a lifetime of dental care! Dr. Vince Fava is a family dentist in Brampton with nearly 25 years of experience and also a father of three. He knows how important a child’s first checkup is and loves making that experience positive and fun for his pediatric patients. If your child is about to have their first checkup and you have any questions, he can be reached via his website.